Zhiqun Lin is currently Professor of Materials Science and Engineering at the Georgia Institute of Technology. His research focuses on nanostructured functional materials (NanoFM). An extensive list of materials currently under investigation in his group includes polymer-based nanocomposites, block copolymers, polymer blends, conjugated polymers, quantum dots (rods, tetrapods, wires), magnetic nanocrystals, metallic nanocrystals, semiconductor metal oxide nanocrystals, ferroelectric nanocrystals, multiferroic nanocrystals, upconversion nanocrystals, thermoelectric nancrystals, core/shell nanoparticles (nanorods), hollow nanocrystals, Janus nanocrystals, nanopores, nanotubes, hierarchically structured and assembled materials, and semiconductor organic-inorganic nanohybrids. For more information, click on Nanostructured Functional Materials (NanoFM) research group website (http://nanofm.mse.gatech.edu/). 66. Y. Chen, Z. Wang, Y. He, Y. J. Yoon, J. Jung, G. Zhang, and Z. Lin*, "Light-Enabled Reversible Self-Assembly and Tunable Optical Properties of Stable Hairy Nanoparticles”, Proceedings of the National Academy of Sciences of the United State of America, 115, E1391 (2018). (Highlighted by: [NSF] and more). 65. H. Yang, Y. Wu, Q. Lin, L. Fan, X. Chai, Q. Zhang, J. Liu, C. He,* and Z. Lin*, "Composition Tailoring by N and S Co-doping and Structure Tuning by Constructing Hierarchical Pores: Metal-Free Catalysts for High-Performance Electrochemical Reduction of CO2”, Angewandte Chemie International Edition 57, 15476 (2018) (selected as a Very Important Paper (VIP)). 63. W. Wang, D. Shen, X. Li, Y. Yao, J. Lin, A. Wang, J. Yu, Z. L. Wang, S. W. Hong, Z. Lin,* and S. Lin* , "Light-Driven Shape Memory Porous Films with Precisely Controlled Dimensions”, Angewandte Chemie International Edition 57, 2139 (2018). (selected as a Very Important Paper (VIP). 62. X. Meng, C. Yu, X. Song, J. Iocozzia, J. Hong, M. Rager, H. Jin, S. Wang, L. Huang, J. Qiu, and Z. Lin*, "Scrutinizing Defects and Defect Density of Selenium-Doped Graphene for High-Efficiency Triiodide Reduction in Dye-Sensitized Solar Cell”, Angewandte Chemie International Edition 57, 4682 (2018). 61. D. Ma, Y. Li, H. Mi, S. Luo, P. Zhang*, Z. Lin*, J. Li, H. Zhang, "Robust SnO2-x Nanoparticle-Impregnated Carbon Nanofibers with Outstanding Electrochemical Performance for Advanced Sodium-ion Batteries”, Angewandte Chemie International Edition, 57, 8901 (2018) (selected as Hot Paper; featured on the cover of Angewandte Chemie International Edition). 60. M. Zhu, S. Pan, Y. Wang, P. Tang, F. Qiu, Z. Lin,* and J. Peng*, "Unravelling Correlation between Charge Mobility and Cocrystallization in Rod-Rod Block Copolymer for High-Performance Field-Effect Transistors”, Angewandte Chemie International Edition, 57, 8644 (2018) (selected as a Very Important Paper (VIP)). 59. R. Liu, X. Kuang, J. Deng, Y. Wang, A. C. Wang, W. Ding, Y. Lai, J. Chen, P. Wang, Z. Lin, H. J. Qi, B. Sun, and Z. L. Wang, "Shape memory polymers for body motion energy harvesting and self-powered mechano-sensing”, Advanced Materials, 30, 1705195 (2018). 58. C. Xu, A. Wang, H. Zou, B. Zhang, C. Zhang, Y. Zi, L. Pan, P. Wang, P. Feng, Z. Lin, and Z. L. Wang, "Raising the Working Temperature of a Triboelectric Nanogenerator by Quenching down Electron Thermionic Emission in Contact-Electrification”, Advanced Materials, 11, 772 (2018). 57. J. Mao, J. Iocozzia, J. Huang, K. Meng, Y. Lai*, and Z Lin*, "Graphene Aerogels for Efficient Energy Storage and Conversion”, Energy & Environmental Science 11, 772 (2018) (featured on the cover of Energy & Environmental Science). 56. X. Meng, C. Yu, X. Zhang, L. Huang, M. Rager, J. Hong, J. Qiu,* and Z. Lin* "Active sites-enriched carbon matrix enables efficient triiodide reduction in dye-sensitized solar cells: an understanding of the active centers”, Nano Energy 54, 138 (2018). 55. X. Meng, X. Cui, M. Rager, S. Zhang, Z. Wang, J. Yu, Y. Harn, Z. Kang, B. K. Wagner, Y. Liu, C. Yu, J. Qiu,* and Z. Lin*, "Cascade charge transfer enabled by incorporating edge-enriched graphene nanoribbons for mesostructured perovskite solar cells with enhanced performance”, Nano Energy, 52, 123 (2018). 54. D. Ma, Y. Li, J. Yang, H. Mi, S. Luo, L. Deng, C. Yan, P. Zhang,* Z. Lin,* X. Ren, J. Li, and H. Zhang, "Atomic Layer Deposition-Enabled Ultrastable Freestanding Carbon-Selenium Cathodes with High Mass Loading for Sodium-Selenium Battery ”, Nano Energy, 43, 317 (2018) (featured on the cover of Nano Energy). 53. Q. Hu, X. Liu, B. Zhu, L. Fan, X. Chai, Q. Zhang, J. Liu, and C. He*, and Z. Lin*, "Crafting MoC2-doped Bimetallic Alloy Nanoparticles Encapsulated within N-doped Graphene as Roust Bifunctional Electrocatalysts for Overall Water Splitting ”, Nano Energy, 50, 212 (2018) (featured on the cover of Nano Energy). 52. 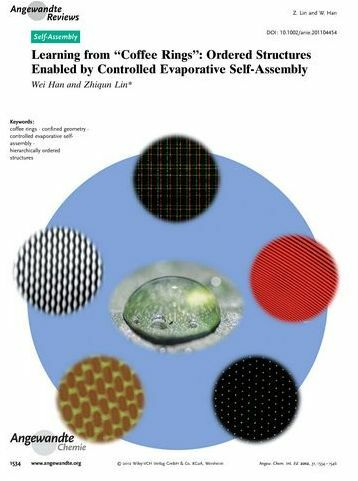 H.Wang, R. Liu, Y. Li,* X. Lü, Q. Wang, S. Zhao, K. Yuan, Z. Cui, X. Li, S. Xin, R. Zhang, M. Lei,* and Z. Lin*, "Hollow porous spinel ZnMnCoO4 microspheres with a high oxygen reduction activity and an outstanding durability”, Joule, 2, 337 (2018). 51. M. He, B. Li, X. Cui, B. Jiang, Y. He, Y. Chen, D. O’Neil, P. Szymanski, M. A. EI-Sayed, J. Huang, and Z. Lin*, "Meniscus-Assisted Solution Printing of Large-Grained Perovskite Films for High-Efficiency Solar Cells”, Nature Communications, 8, 16045, (2017). 50. Y. Chen, D. Yang, Y. J. Yoon, X. Pang, Z. Wang, J. Jung, Y. He, Y. W. Harn, M. He, S. Zhang, G. Zhang, and Z. Lin* , "Hairy Uniform Permanently-Ligated Hollow Nanoparticles with Precise Dimension Control and Tunable Optical Properties”, Journal of the American Chemical Society 139, 12956 (2017). 46. Y. He, X. Pang, B. Jiang, C. Feng, Y. Harn, Y. Chen, Y. Yoon, S. Pan, C.-H. Lu, Y.Chang, M. Zebarjadi, Z. Kang, N. Thadhani, J. Peng, and Z. Lin* , "Unconventional route to uniform hollow semiconducting nanoparticles with tailorable dimensions, compositions, surface chemistry and near-infrared absorption”, Angewandte Chemie International Edition, 56, 12946 (2017). 44. X. Pang, Y. He, J. Jung, and Z. Lin*, "1D Nanocrystals with Precisely Controlled Dimension, Composition and Architecture”, Science. 353, 1268 (2016). 43. Y. Guo, J. Li, Y. Yuan*, L. Li, M. Zhang, C. Zhou, and Z. Lin*, "A Rapid Microwave-Assisted Thermolysis Route to Highly Crystalline Carbon Nitrides for High-Efficiency Hydrogen Generation”,Angewandte Chemie International Edition. 55, 14693 (2016). 40. M. He, X. Pang, X. Liu, B. Jiang, Y. He, H. Snaith, and Z. Lin*, "Monodisperse Dual-Functional Upconversion Nanoparticles-Enabled Near-Infrared Organolead Halide Perovskite Solar Cells”,Angewandte Chemie International Edition. 55, 4280 (2016). 39. S. Wu, C. Han, J. Iocozzia, M. Lu, R. Ge, R. Xu, and Z. Lin*, "Germanium-based Nanomaterials for Rechargeable Batteries”, Angewandte Chemie International Edition. 55, 7898 (2016). 38. Y. Yang*, C. Han, B. Jiang, J. Iocozzia, D. Shi, T. Jiang, and Z. Lin*, "Graphene-based Materials with Tailored Nanostructures for Energy Conversion and Storage”, Materials Science and Engineering R: Reports. 102, 1 (2016). 37. B. Jiang, C. Han, B. Li, Y. He, and Z. Lin*, "In-situ Crafting of ZnFe2O4 Nanoparticles Impregnated within Continuous Carbon Network as Advanced Anode Materials”, ACS Nano. 10, 2728 (2016). 36. C. Wang, L. Tang, Y. He,* S. Wang, L. Gan, J. Li, H. Du, B. Li, Z. Lin*, and F. Kang*, "A robust strategy for crafting monodisperse Li4Ti5O12 nanospheres as superior rate anode for lithium ion batteries”,Nano Energy. 21, 133 (2016). 34. B. Jiang, X. Pang, B. Li, and Z. Lin*, "Organic-inorganic nanocomposites via placing monodisperse ferroelectric nanocrystals in direct and permanent connect with ferroelectric polymers", Journal of the American Chemical Society, 137, 11760 (2015). 33. J. Hu, A. Liu, H. Jin, D. Ma, D. Yin, P. Lin, Shun Wang, Z. Lin* and J. Wang, "A versatile strategy for shish-kebab-like multi-heterostructured chalcogenides and enhanced photocatalytic hydrogen evolution”, Journal of the American Chemical Society, 137, 11004 (2015). 32. D. Yang, X. Pang, Y. He, Y. Wang, G. Chen, W. Wang, and Z. Lin*, "Precisely size-tunable magnetic/plasmonic core/shell nanoparticles with controlled optical properties”, Angewandte Chemie International Edition, 54, 12091 (2015). 31. H. Xu, X. Pang, Y. He, M. He, J. Jung, H. Xia, and Z. Lin*, "An unconventional route to monodisperse and intimate semiconducting organic-inorganic nanocomposites”, Angewandte Chemie International Edition, 54, 4636 (2015). 30. B. Li, C. Zhang, B. Jiang, W. Han, and Z. Lin*, "Flow-enabled self-assembly of large-scale aligned nanowires”, Angewandte Chemie International Edition, 54, 4250 (2015). 29. Y. Yang, W. Zhan, R. Peng, C. He, X. Pang, D. Shi, T. Jiang, and Z. Lin*, "Graphene-enabled superior and tunable photomechanical actuation in liquid crystalline elastomer nanocomposites”, Advanced Materials, 27, 6376 (2015). 28. S. Wu, R. Xu, M. Lu, R. Ge, J. Iocozzia, C. Han, B. Jiang, and Z. Lin*, "Graphene-containing nanomaterials for lithium ion battery”, Advanced Energy Materials, 5, 1500400 (2015). 27. S. H. Kang, S. Hwang, Z. Lin*, S. H. Kwon, and S. W. Hong, "A robust highly aligned DAN nanowire array-enabled lithography for graphene nanoribbon transistors”, Nano Letters, 15, 7913 (2015). 26. X. Cao, Q. Zhao, Z. Lin*, and H. Xia, "The chemistry of aromatic osmacycles”, Accounts of Chemical Research. 47, 341 (2014). 25. X. Pang, C. Wan, M. Wang, and Z. Lin*, "Strictly biphasic soft and hard Janus structures: synthesis, properties and applications”, Angewandte Chemie International Edition, 53, 5524 (2014). 24. B. Li, W. Han, B. Jiang, and Z. Lin*, "Crafting threads of diblock copolymer micelles via flow-enabled self-assembly”, ACS Nano, 8, 2936 (2014). 23. M. Wang, J. Ioccozia, L. Sun, C. Lin, and Z. Lin*, "Inorganic-modified semiconductor TiO2 nanotube arrays for photocatalysis”, Energy & Environmental Science , 7, 2182 (2014). 22. X. Pang, L. Zhao, W. Han, X. Xin, and Z. Lin*, "A general and robust strategy for the synthesis of nearly monodisperse colloidal nanocrystals”, Nature Nanotechnology, 8, 426 (2013). 21. W. Han, M. He, M. Byun, B. Li, and Z. Lin*, “Large-scale hierarchically structured conjugated polymer assemblies with enhanced electrical conductivity”, Angewandte Chemie International Edition, 52, 2564 (2013). 19. M. Ye, D. Zheng, M. Lv, C. Chen, C. Lin, and Z. Lin*, "Hierarchically structured nanotubes for highly efficient dye-sensitized solar cells”, Advanced Materials, 25, 3039 (2013). 18. W. Han, B. Li, and Z. Lin*, "Drying-mediated assembly of colloidal nanoparticles into large-scale microchannels”, ACS Nano , 7, 6079 (2013). 17. B. Li, W. Han, M. Byun, L. Zhu, Q. Zou, and Z. Lin*, "Macroscopic highly aligned DNA nanowires created by controlled evaporative self-assembly”, ACS Nano, 7, 4326 (2013). 16. M. Wang, L. Sun, Z. Lin*, J. Cai, K. Xie, and C. Lin, "p-n heterojunction photoelectrodes composed of Cu2O-loaded TiO2 nanotube arrays with enhanced photoelectrochemical and photoelectrocatalytic activities”, Energy & Environmental Science, 6, 1211 (2013). 15. M. He, F. Qiu, and Z. Lin*, "Towards high-performance polymer-based thermoelectric materials”,Energy & Environmental Science, 6, 1352 (2103). 14. M. Ye, J. Gong, Y. Lai, C. Lin, and Z. Lin*, “High efficiency photoelectrocatalytic hydrogen generation enabled by palladium quantum dots sensitized TiO2 nanotube arrays”, Journal of the American Chemical Society, 134, 15720 (2012). 13. W. Han, M. Byun, B. Li, X. Pang, and Z. Lin*, “A simple route to hierarchically assembled micelles and inorganic nanoparticles”, Angewandte Chemie International Edition, 51, 12588 (2012). 12. W. Han and Z. Lin*, "Learning from "coffee rings": ordered structures enabled by controlled evaporative self-assembly", Angewandte Chemie International Edition, 51, 1534 (2012). 11. L. Zhao and Z. Lin*, “Crafting semiconductor organic-inorganic nanocomposites via placing conjugated polymers in intimate contact with nanocrystals for hybrid solar cells”, Advanced Materials, 24, 4353 (2012). 10. Y. Jang, X. Xin, M. Byun, Y. Jiang, Z. Lin* and D. Kim, "An unconventional route to high-efficiency dye-sensitized solar cells via embedding graphitic thin films into TiO2 nanoparticle photoanode", Nano Letters, 12, 479 (2012). 8. X. Xin, M. He, W. Han, and Z. Lin*, "Low-cost CZTS counter electrodes for high-efficiency dye sensitized solar cells”, Angewandte Chemie International Edition, 50, 11739 (2011). 7. L. Zhao, X. Pang, R. Adhikary, J. Petrich, and Z. Lin*, "Semiconductor anisotropic nanocomposites via directly coupling conjugated polymers with quantum rods”, Angewandte Chemie International Edition, 50, 3958 (2011). 6. L. Zhao, X. Pang, R. Adhikary, J. Petrich, M. Jeffries-EL, and Z. Lin*, "Organic-inorganic nanocomposites by placing conjugated polymers in intimate contact with quantum rods”, Advanced Materials, 23, 2844 (2011). 5. M. Ye, X. Xin, C. Lin, and Z. Lin*, "High efficiency dye-sensitized solar cells based on hierarchically structured nanotubes”, Nano Letters, 11, 3214 (2011). 4. M. He, W. Han, J. Ge,Y. L. Yang, F. Qiu, and Z. Lin*, "High efficiency all-conjugated poly(3-alkylthiophene) diblock copolymer-based bulk heterojunction solar cells with controlled molecular organization and nanoscale morphology", Energy & Environmental Science, 4, 2894 (2011). 3. M. Byun, N. B. Bowden, and Z. Lin*, "Hierarchically organized structures engineered from controlled evaporative self-assembly", Nano Letters, 10, 3111 (2010). 2. M. He, L. Zhao, J. Wang, W. Han, Y. L. Yang, F. Qiu, and Z. Lin*, "Self-assembly of all-conjugated poly(3-alkylthiophene) diblock copolymer nanostructures from mixed selective solvents", ACS Nano, 4, 3241, (2010). 1. M. Goodman, L. Zhao, and Z. Lin*, "Self-assembly of CdTe tetrapods into network monolayers at air/water interface", ACS Nano, 4, 2043 (2010).